Meet Dillon, my sourdough starter. It’s an offspring from an 10 year old Australian starter, which was a gift from my friend Celia (you’ll read all about it in my book!) Together, we created Artisan Sourdough Made Simple. If you’re new to sourdough, a starter is a live fermented culture of flour and water. Once it becomes all bubbly and active a small portion is added to your bread dough to make it rise- no commercial yeast is required. You’ll find more detailed writing and supplemental information in my book (trust me, I could go on and on!) but for now, all you need to know is this: without a starter the whole concept of sourdough baking would not exist. So, what type of container is best for your starter? Does it even matter? In my experience, sourdough storage depends on the baker’s preference. To be honest, I’ve never heard of a container that’s necessarily good or bad, but I’m sure you’ll get all kinds of opinions if you ask around! In fact, I love when people post their starters to Instagram or to their blog. It’s fun to see the variety. This is my personal favorite. Over the years I’ve moved away from plastic containers and Tupperware out of choice. I like glass. It’s easy to clean and you don’t have to worry about any weird chemicals leaching into your starter. Also, because glass is clear you can see everything that’s going on inside (all the bubbles, foamy stuff, any liquid… ). This instant visual access is super important when getting to know your starter and what you can do to fix it, if necessary. I’ll never forget: over the summer a fleet of fruit flies decided to take up residence in my jar. Had I been using a solid container of some sort, I never would’ve seen them! Gross, I know. There are all types of glass jars you can choose from: mason jars, jam jars, latch top jars, canning jars with those metal ring tops you can never find… it’s up to you. Regarding jar size, it’s all relative to the amount of starter you currently have or want to maintain in the future. Your starter will grow to at least double in size, sometimes more, and you’ll need a jar to accommodate this. You can cover it loosely with a lid, plastic wrap, or even a small cloth. I go back and forth depending on my mood. Keep in mind, the jar might burst if the lid is on too tight which means you’ll run the risk of getting glass shards in the mixture. This happened to me once and I had to throw the whole thing out. I use a 3/4 L jar for my starter, which is pictured above. You can purchase it here. Although my preference is glass, I first started with a plastic container. I had no problems with it at all. From memory, I think it was a small, random BPA-free Tupperware container I unearthed from the depths of my kitchen cabinet. As previously mentioned, I moved away from plastic. But there’s another reason why I made the switch: size. Most plastic containers (unless you’re using a Chinese quart container for soup) are not tall. They’re wide and squat. I didn’t like this because it was hard to tell when my starter had doubled in size, which is a visual benchmark for when it’s ready to use. When all of my glass jars are dirty or being used for something else, I use a pint glass! Yes, the kind you drink beer from at a bar. These are perfect for sourdough starters. They are nice and tall, and you can cover the top with a cloth or plastic wrap. Any type of large and tall glass will do. I have a stash in my kitchen. Personally, I’ve never used this. King Arthur Flour offers large sourdough crocks which seem pretty popular. The selling point is that its material is non-reactive and the crock itself is easy to identify, so you won’t accidentally throw it out because it looks like pancake batter in a jar (see option #3). Unlike glass, I’m pretty sure these crocks do not burst easily either. Regardless, I still prefer clear containers so I can monitor what’s going on inside. Whatever container you choose, the trick is to play around to see what you like. You might begin with a certain jar only to realize that it’s particularly annoying to clean, which then motivates you to switch to something else. And this is okay. Plus, overtime your starter will form crusty bits of dried flour at the top of the container and near the lid. When this happens (and it will), you’ll need to change it out anyway. So get creative and experiment with what you have! So what about you? 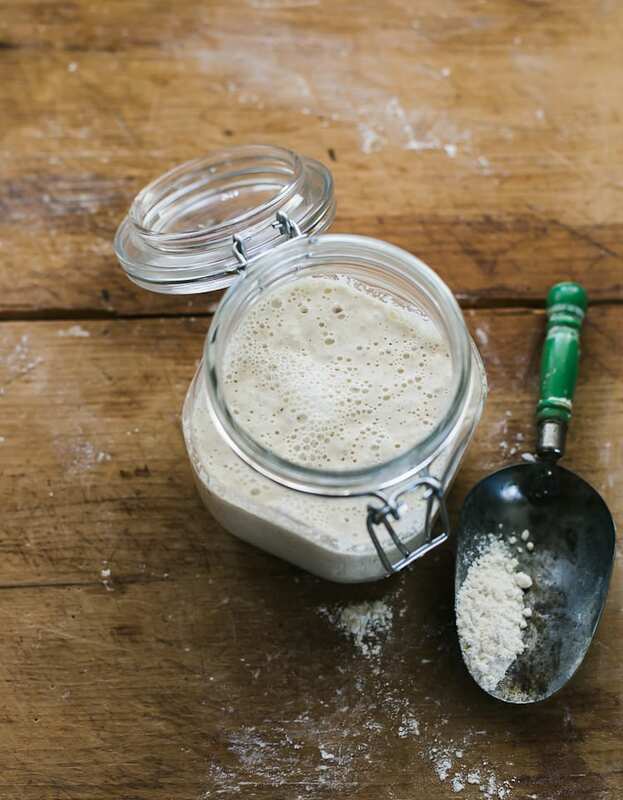 What type of container do you use for your sourdough starter? Need a sourdough starter? Click here for more info! a small portion goes into storage in the glass jar like yours. I keep two starters going, one as a reserve, after once feeding with milk rather than water by mistake.. I keep them in those plastic basins with clip on lids, which have three tiny holes in the top, they are sold to cook steamed puddings in. I have considered glass, but was concerned about the lids but also that I might drop them getting them in and out of the fridge, should they be really cold or have slight condensation. Maybe I worry unduly. I am with you on glass, most importantly because it is non-reactive and does not degrade. The visibility of clear glass is also a plus. Although some plastics are listed as stable and food-safe, others are not and are subject to outgassing and degrading. I have been shocked to see how Tupperware degrades over time. There can be no doubt that glass is the safest from a chemical standpoint. There is, however one caveat. For those of us who are aging glass (and stoneware along with it) presents a set of hazards all its own. Far heavier than plastic, it is easy to drop, especially if one is beset with arthritis, weakness, and other “grab & hold” issues. When glass hits the floor it is subject to shattering, another serious hazard. Again, congratulations on your newest volume, and I send my best wishes for great success! Sourdough starters will change texture from time to time, which is completely normal. Luckily, it’s very easy to fix! I use the same jar you show pictured in the photo! It seems to work well. I can’t wait to check out your new cookbook. What size jar is this in the photo? I want to make sure mine is big enough :) Do you store you starter in this type of jar? I just received your new cookbook, and I can’t stop looking through it! It is just beautiful. My sour dough starter, which I have not named yet, will be 3 years old in November. I first started out with potato water, but somehow that didn’t work for me. Maybe it wasn’t concentrated enough, but the starter just didn’t rise (read about that in the WSJ). I use King Arthur’s crock pot. The lid shouldn’t be tight, and the reason for that is the starter absorbs the yeast from the air in the kitchen. It was difficult for me to comprehend that this is really happening. I learned it from a rather scientific book, written by Samuel Fromartz. The book is called In Search Of The Perfect Loaf. It takes my started about 8 hours to be fully risen. And it also gave me trouble a couple of times, especially during hot summer days. After a little bit of experimenting I was able to rescue it each time. Baking bread this way is a lot of work, but how fulfilling to taste a wonderful home baked Artisan bread. Hi Amy! This is exactly what I do! No matter what container you put your starter in, it will eventually get crusty. It’s always good to have some back up jars. Thanks for sharing your experience! So do you cover the lid opening with something or just lay the lid up over it? I’m assuming you don’t clamp it down because it would be airtight. Or am I wrong? I’ve been wondering this same thing! I have this exact jar, but have just been laying a cloth over it, because I assume (but don’t know for sure) that it shouldn’t be clamped shut. You can keep it airtight or covered loosely; it’s up to you. Some people like to keep it airtight to prevent flies or other foreign objects from getting into the jar (this will happen at some point). And others like to keep it covered loosely to allow a bit of air into the jar for yeast development. Either way, in my experience, BOTH techniques work. Experiment and see what works for you! I lay a cloth napkin or couple layers of cheesecloth over the top before I close the lid and then clamp it down. This keeps flies out but still prevents it from becoming overpressurized. Thanks for the article! Love this tip, Ian. Thank you! Looking forward to following your blog and tips. Absolutely love your book, Artisan Bread Made Simple”. Thank you for sharing your amazing recipes. Thanks for this article! I have to increase the amount of my starter to accommodate a greater need for bread during the week, so I’m researching containers. I love reading all the starter names in the comments! William Butler Yeast was created several years ago, after I killed Mannie, Julia, and Fred. I have sour dough starter that I have been feeding and using for about a month now. My question is I do not have any hooch forming. I keep it on the kitchen counter, because I bake something every day( baguette, crackers and loaves) should I have hooch? We live in Florida, my kitchen stays around 78 degrees. It you don’t have hooch, that’s ok! Hooch is just a result of your starter needing to be fed. But since you bake daily, your starter is most likely fed daily, which would eliminate hooch in the first place. Hope this helps! And thanks so much- enjoy the blog! Thanks for the article! I have a couple Weck jars at home, but they are only 0.5L. Is this large enough for a starter, or should I buy the 0.75 or 1.0L jars? Hi Jacob! It depends on how much starter you want to have on hand to begin with. For example, if you only want to keep a small amount, the .5L will work. But, if you want to keep a larger amount with room for growth, you might want to consider the larger sizes. Better to have more room than less. Hope this helps! Purchased your new book but would like to purchase some of your starter also. Thank you. I have just recently started my own starter and it is almost time to store it. I am worried my jar might not be right for my starter. I purchased a clasp closing canning jar (looks like your first picture above). I noticed in your picture the jar does not have its sealing ring. Do you think my jar may be ok? I plan on storing my starter in the refrigerator if that helps. Just had a question about the crusty bits that form on top? Do you mix that back in or scoop it out? Just reading up before I start this endeavor! Thank you for this most interesting web page. About the size of the jar when growing a starter from the beginning, I would recommend a 2L jar, because a starter might easily double or triple in size if it happens to grow vigorously. My late mother used to have a wooden tub (perhaps 10 liters by volume) when she baked sour rye bread. She simply left some of the dough in the tub covered by a linen cloth. That was (and is) the traditional way (at least in Finland) to preserve the starter (or “root”) “from mother to daughter”. Question: How often do you wash your jar? I established my starter in December, and I was going to dry my starter out over the holidays (when I wasn’t home, so I could use the oven), and wash my jar, but I didn’t. I still have yet to wash my jar. There are some crusty parts, though I try to scrap them out when I can. I bake about once a week, and keep my starter in the fridge. I am using a glass jar with a plastic lid (though I cover it with plastic wrap first), that is about 1 L, but I’m not totally sure about the size. I think it could hold at least two cups, possibly even 3 or 4 cups.